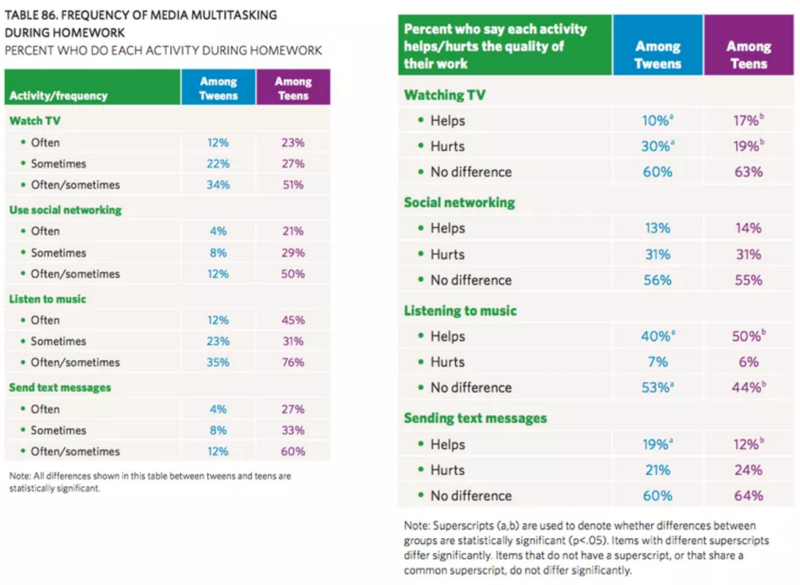 Just in time for Media Literacy Week earlier this month, Common Sense Media has released a new study on how tweens and teens (aged 8-18) in the United States use media and connected technology. 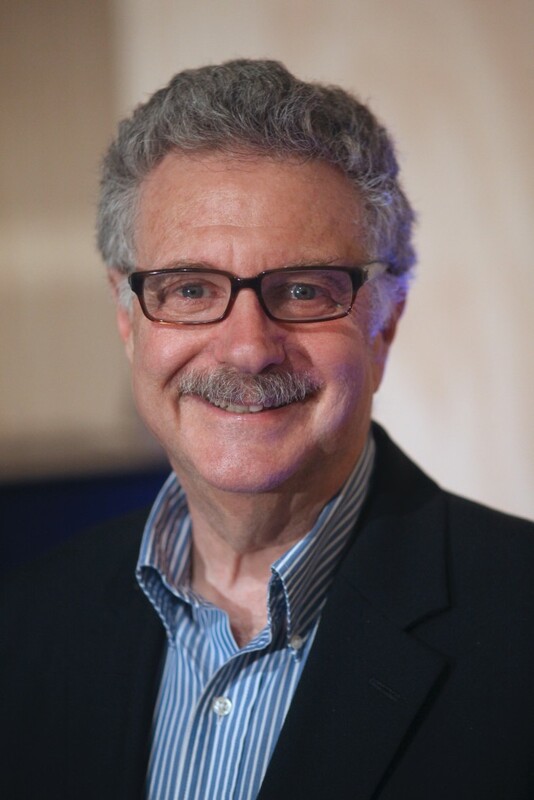 Larry Magid takes a closer look at the research and shares his insights on current trends around children’s and young people’s media use. Larry is a technology journalist and an Internet safety advocate. 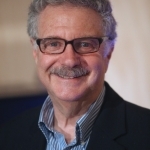 He is CEO and co-founder of ConnectSafely and an on-air technology analyst for CBS News. There is a lot to absorb from Common Sense Media’s extensive study based on a large national sample of more than 2,600 tweens and teens in the US. Overall, I think it paints a relatively optimistic picture of our youth. Yes, they are consuming a lot of media and, yes, most is for entertainment purposes, yet by most standards young people in our country are doing pretty well at school and most seem to be emotionally well-balanced. That isn’t to say that there aren’t some challenges. It’s not surprising that youth from low-income families have less access to connected technology than those from higher income families but it’s interesting to note that they do spend more time with media as do black youth when compared to whites and Hispanics. The same is true for youth whose parents have only a high school education who, on average, spend an average of nearly two more hours (1:50) consuming media than those whose parents have a higher education. Tweens average more than four and a half hours (4:36) of screen media use a day and teens more than six and a half hours (6:40) a day. 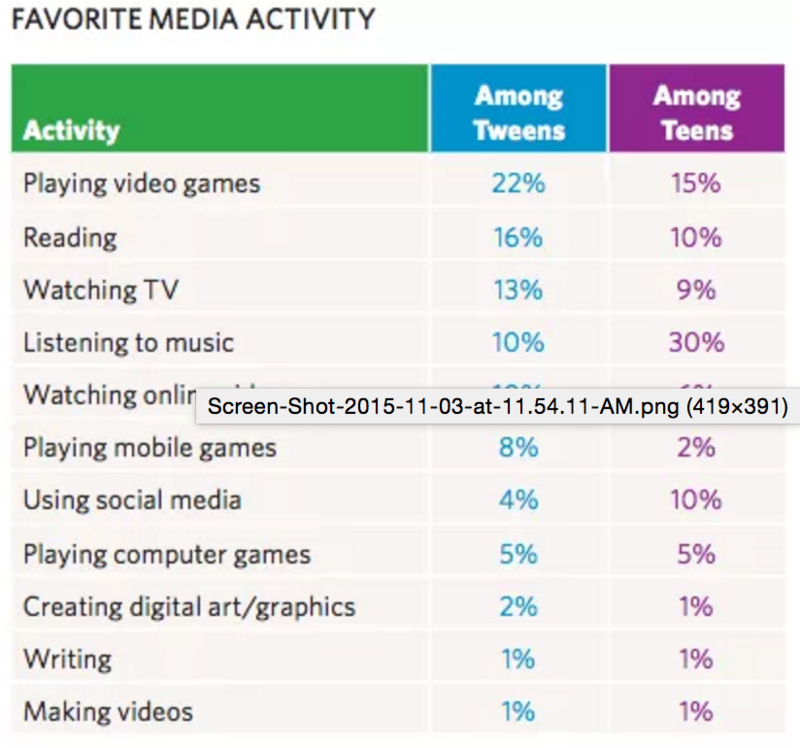 A majority of teens (57%) spend more than four hours per day with screen media. Don’t count me among those who are “shocked” by how much time kids are using media on a daily basis. True, the study showed that kids spend average more than four and a half hours (4:36) of screen media use a day and teens more than six and a half hours (6:40) a day and that majority of teens (57%) spend more than four hours per day with screen media. But, read on. Just because kids are heavy media consumers doesn’t mean that nothing good is going on nor does it indicate that kids are necessarily consuming that much more media than they were before the Internet. In 1961, then FCC Chairman Newton Minow gave a speech where he referred to TV as a “vast wasteland.” That was 54 years ago and, somehow, we’ve managed to survive. Despite all our new options, watching TV and listening to music remain the dominant forms of entertainment. Nearly two-thirds (62%) of teens say they watch TV “every day” compared to 24% who daily watch online video such as YouTube or 27% who play mobile games on a daily basis. Nearly three quarters (73%) indicated “listen to music” as their top media entertainment activity. 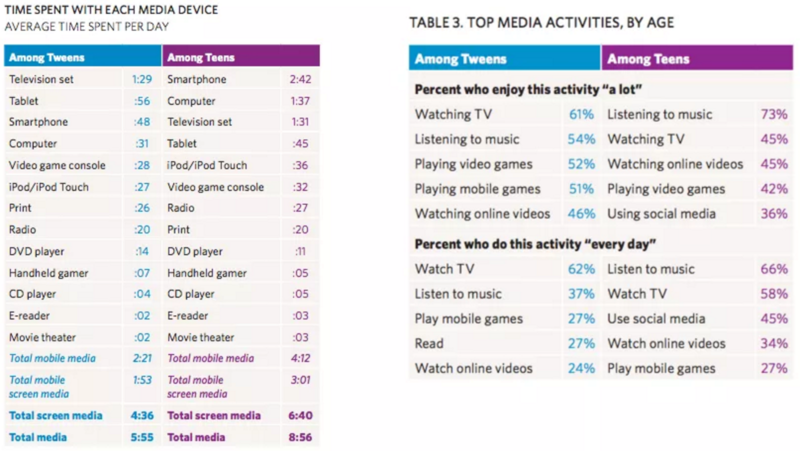 And when it comes to time spent, the TV set remained the most dominant device for tweens (1:29) and the third most popular for teens (1:31) who spend far more time with their smartphones and slightly more time with their computers. I’m not sure how those numbers compare to pre-Internet days but, anecdotally, I can tell you that TV watching and listening to music was extremely popular when I was a tween and teen. The difference now is that young people can listen and watch on a variety of devices including mobile devices that they likely have with them when they are away from home. Some people may also be surprised to learn that “even among teens, social media use still lags behind traditional media use.” On average, teens spend 1 hour, 11 minutes a day using social media which represents less than a fifth of their total media use. Nearly half of the teens (45%) say they use social media “every day” which is fewer than listen to music (66%) or watch TV (58%) and only 36% of teens say they enjoy using social media “a lot,” compared to 73% for music and 45% for TV. Only 10% of teens (14% of girls and 5% of boys) named social media their “favorite” media-related activity, compared with 30% who chose listening to music. Reading also scored at 10%. This could confirm the theory that social media has become more of a utility for youth, with them using it to keep up with what friends are saying and doing, check on what people are saying about them and simply remaining part of their social environment. For me, one of the more interesting findings is the “vast diversity of ways young people interact with media—the remarkable variety in their preferences and patterns of use.” The researchers point out, for example, that for tweens, “playing video games tops the list of favorite media activities but is the favorite of less than a quarter (22%) of tweens, followed by reading (16%), watching TV (13%), listening to music (10%), watching online videos (10%), and playing mobile games (8%).” Listening to music comes out as the favorite activity for teens, but only by 30%, followed by playing video games (15%), reading (10%), using social media (10%), and watching TV (9%). The survey had some good news about the social and emotional well-being of young people. 88% of tweens and 78% of teens say it is “very” or “somewhat” true that they have a lot of friends. A significant minority (16% of tweens and 22% of teens) say “I am often sad or unhappy” while 16% of tweens and 10% of teens say “I often get into trouble.” More than half (53% of tweens and 58% of teens) say “I am often bored,” but I don’t know if that’s necessary a bad thing. The study did find that tweens who are lower on the social-emotional well being scale “spend an average of over two hours (2:05) more with screen media per day than those at the high end of the scale. For teens the difference is an average of two and a half hours of screen media a day (2:32). But, as a caution, remember that correlation doesn’t mean causation. While it could be that excessive media makes kids less happy, it’s equally possible that unhappy kids are more prone to excessive media use. The study found that the vast majority of media time (78% among tweens and 64% among teens) is still devoted to what the study’s authors broadly call ‘passive consumption’ and ‘interactive consumption,’ such as watching, listening, reading, and playing with media content created by others. Only 3% of tweens and teens are using media for “content creation.” I’m not exactly sure that they are including in this category – for example, it’s not clear if they are counting homework or projects at school as “content creation” and how they are accounting for spent web browsing, reading or even watching or listening to media as part of the content creation process. Speaking for myself, as a professional writer and broadcaster, I spend more time consuming and analyzing the content that I write and broadcast about than I do for actual writing and broadcasting. Not surprisingly, a lot of teens use media while doing homework. And, as numerous studies have shown, there really is no such things as multi-tasking with the possible exception of listening to music while working. Most, said the researchers, say that media use doesn’t make a difference in the quality of their homework while half (50%) say that listening to music while doing homework actually improves the quality of their work. What’s amazing to me is the number of tweens and teens who feel that doing other activities make no difference. It would be interesting to correlate this with how well they are doing in school. So, yes there are reasons to be concerned about our kids’ consumption of media. But there are also reasons to be optimistic. Media has been around for centuries and electronic media has been here longer than any of us can remember and — so far — the world hasn’t come to an end. If anything most kids are smarter, healthier and less prone to be victimized by crime than they were generations ago. I’m not saying that media gets the credit, but the growth of online media has not correlated with bad outcomes for children. This text was originally published on the ConnectSafely Blog and has been re-posted with permission.